Fully double flowers with flat broad florets with rounded or pointed tips. Due to the large flower sizes (some produce 'Dinnerplate' size blooms of up to 1 ft across) these are probably the most popular dahlia types of them all. The choice of available colours is endless: one of them is sure to be your favourite. In borders, perennial- and flower-beds and for cutflowers. 'Arabian Night' (dark red), 'Autumn Fairy' (apricot), 'Babylon Red' (red), 'Blue Bell' (purple), 'Duet' (red & white), 'Kelvin Floodlight' (yellow), 'Lilac Time' (violet), 'Seattle' (yellow & white), 'Vancouver' (purple & white) and 'White Perfection' (white). * PLANTING NOTE: do not plant too deep, the crown of the tuber should be just below or at soil level. Adjust your planting dept according to the size of the tuber. Central America, Mexico and Columbia. The Aztecs gathered and cultivated dahlias for food, ceremonial and decorative purposes and the long woody stems of one variety was used for small pipes. 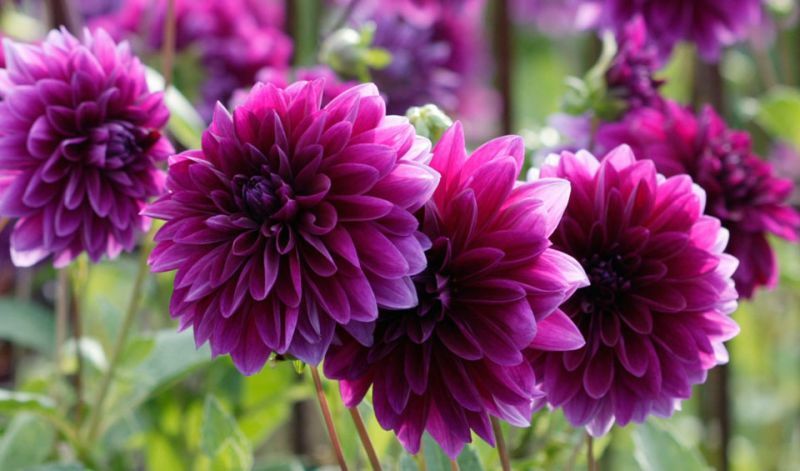 The dahlia is named after 18th century Swedish botanist Anders Dahl. It was named the national flower of Mexico in 1963.